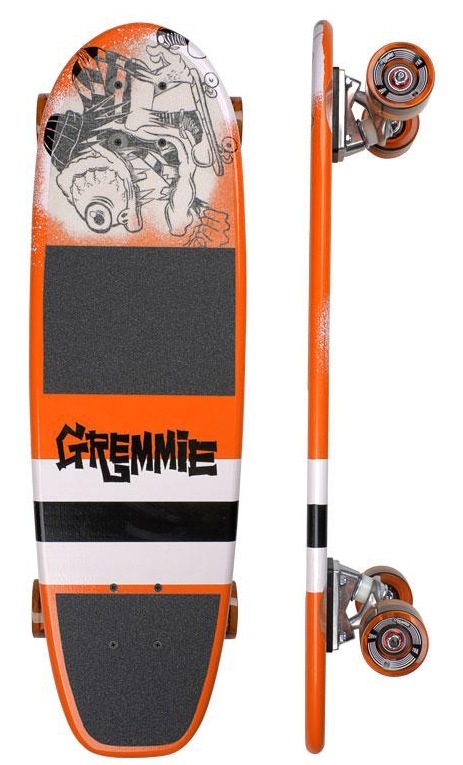 Gremmie Skateboards make mean little cruiser boards fashioned to the early days of skateboarding. When skateboards where still very much tied to surfer culture, and the DIY-spirit of making your own hacked deck was an extension of Hot-Rod culture. The longest of these decks is 29″ and have some grippy 78a clear wheels. Since you’re not going to want to screw up the art on the top side and the deck is virtually flat; I recommend going bare foot. One of the reason I dig these boards so much is that Hot Rod era art. Ed “Big Daddy” Roth often painted his infamous Rat Fink and various other characters standing on a tricked out Skateboard. And while you could find a few crappy products with Rat Fink on them, none capture the attitude like these Gremmies!